Traxxas Top Fuel Power Plus has been specifically formulated to provide optimum performance and lifespan with Traxxas Engines, and is the best choice for use in Traxxas cars and trucks delivering power, tuning ease, and protection you can count on. 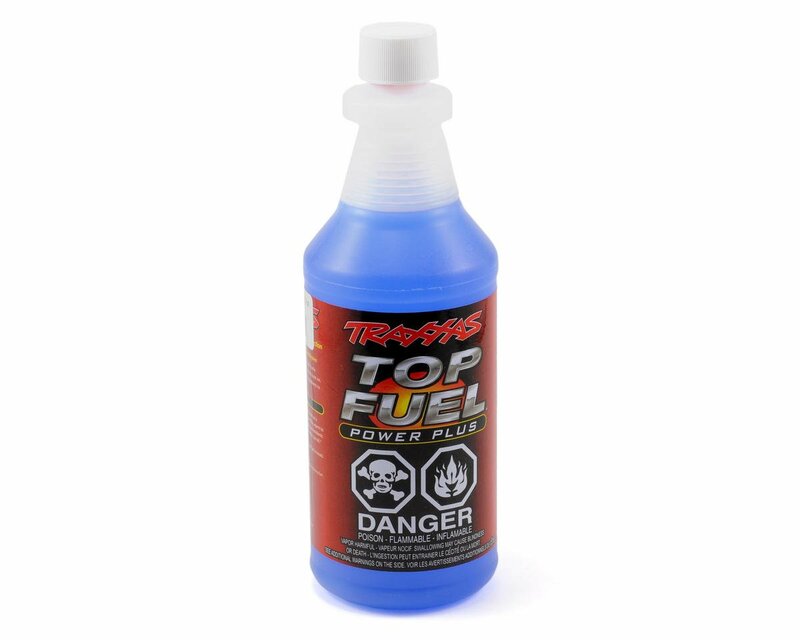 Traxxas Top Fuel Power Plus is quality blended with the best ingredients to protect our engines and our reputation! The new Power Plus blend features superior additives such as a non-foaming agent for consistent running and a wetting agent to improve engine lubrication. Plus, high-performance anti-oxidants and rust inhibitors virtually eliminate the need for after run oil. * Top Fuel Power Plus is made specifically for cars and trucks to meet the incredible demands they place on engines and fuels. The oil percentages are specially balanced to provide just the right amount of lubrication for long engine life and to provide the crisp, clean throttle response you demand in a car fuel. Top Fuel Power Plus is designed to maintain stability and peak performance in hostile nitro environments. The long term performance and reputation of our engines is on the line with each tank of fuel so you can be confident that the blending and lubrication package in Top Fuel Power Plus is going to be just right, time-after-time. Don’t take chances with your engine investment. Use the only fuel that’s 100% Traxxas certified for power and protection in Traxxas engines. Great fuel I have been racing nitro rc cars for 15 years and as of today I run top fuel 20% all day great fuel and oil blend motors love this fuel. I ran magnum fuels 20% before the traxxas top fuel. I didn't know how bad the magnum fuel was, until i ran the Traxxas top fuel. Great stuff easy to read smoke, cool running & easy to tune. No rust at all with a wd-40 after run.